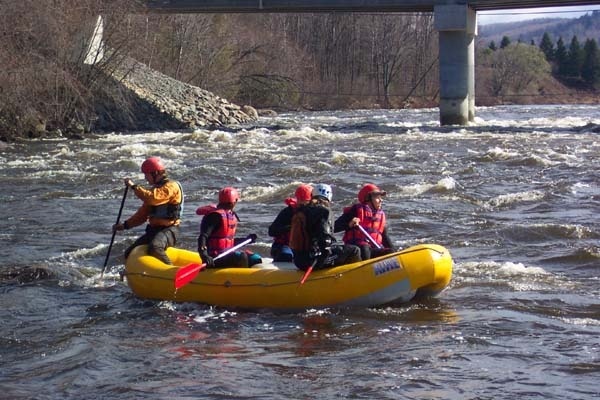 We offer rafting trips on the Rouge river as well as the Devil's river during the spring runoff. We welcome children over 50 lbs, social groups and corporate events. Whether you're looking for a fun family float trip or a wild ride in some serious whitewater, we'll take you out in our AIRE Rafts. These boats use today's technology to ensure the finest crafts available. Let us show you how to surf whitewater, try bodysurfing or a swing on our Tarzan Rope. We'll even treat you to a floating piknik while on the river. We supply all of the equipment including lifejacket, helmet and paddle, ransport to and from the river. We have a large selection of wetsuits avalaible for rental, and offer a photo service so you can take home the memory. So bring your sunscreen, sunglasses and sandals and get ready to have fun ! - Familly Rafting: minimal weight of 50 pounds. - White water rafting: minimal weight of 90 pound, be able to swim, minimum of 12 persons for white water rafting departure.